← Want Visage BSOG? Act NOW. The bonus tracks on the Captain Oi! DLX RM of “The Absolute Game” were eleven strong. The first two were the single versions of “Circus Games” and “Goodbye Civilian.” “Circus Games” was the exact same length as the LP mix: 4:10 – leading me to believe that there was a mastering error at the label, for the 7″ version is listed on Discogs.com as being 3:23. “Goodbye Civilian” was 45 seconds shorter, but there were few mix differences here. Probably only edits. “Circus Games” had “One Decree” as the B-side, and it was on the album. “Woman In Winter” had a live “Yankee Dollar” as its B-side – absent here. This left only one bona fide non-LP B-side on the disc, but it was a doozy. “Monkey McGuire Meets Specky Potter Behind Lochore Institute” was a mouthful of a title, but that belied the stark simplicity of the amphetamine rush of an instrumental that it was. The high BMP mototik drumming and the roaring guitars approximate the thrills of a Le Mans race in a curt 2:53. Actually, there’s a false ending where Jobson asks why they stopped. This, more than anything else I have ever heard by The Skids sounds like it was informed by punk rock. It was in no way anthemic. Then there was the “Strength Through Joy” album to contend with. It dropped the listener right down into “An Incident In Algiers” midway; perhaps as a consequence of it being improvised. There may have been no beginning to it as such. Even so, the lurching, turgid music that was largely the province of bassist/keyboardist Russell Webb and vocalist Jobson, managed to resist approaching charm in any way. Reportedly, it was made by the two members while Stuart Adamson was away. He arrived at the end and added some guitar parts to the assembled tracks. At the very least, this was the sound of the band venturing far from their comfort zone; perhaps yours as well. Things didn’t shape up much better on the appropriately titled “Grievance.” The grinding noise was once again missable and it very much overstayed its welcome. Then, as if to assure us that we didn’t know how good we had it, the pixilated, atonal title track to this album [23 minutes long, by the way] made its appearance. It was all too easy to resist the lure of Jobson bellowing the title over the stomping insect march that was the music bed. It actually reminded me of The Residents at their least listenable; only without any of their naïve charm. 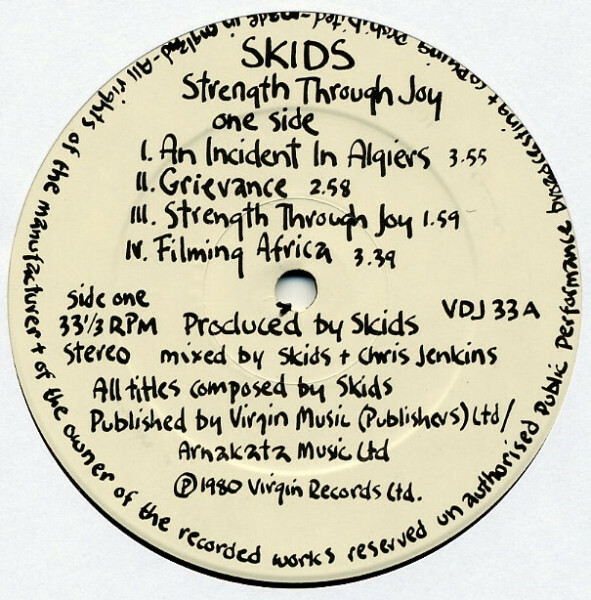 Then, as if to compensate for the torture of these three “songs,” the remainder of the album consisted of Enoesque instrumentals; also far from what one would expect from The Skids, but as soothing to the ear as the first three tracks [with Jobson] had not been. The vibe here was redolent of “Another Green World” or the calmer moments on “Before And After Science.” Incredible… and then it was all over. If one did not know with foreknowledge that the band split apart following “The Absolute Game,” I can just imagine what listening to “Strength Through Joy” must have felt like in a contemporary context, for here was the sound of a band flying apart before your very ears. I have really enjoyed both of The Skids albums that I bought recently. “Days In Europa” has joined many other albums in the winner’s circle for the year 1979, and it pains me to think that I went several decades before hearing it! “The Absolute Game” was a slightly lesser commodity, though still appreciated. It featured the sound of a band snapping back [perhaps too much] to perceived normality after getting their horizons broadened on a sophomore release that was somewhat ill-regarded in its time [though I loved it plenty]. If anything, a relative weakness of “The Absolute Game” was that it telegraphed much of the Big Country sound that never did as much for me as what I’ve heard here. My enjoyment of The Skids has been considerable. Many of these songs have been lodged in my head for the last two weeks. They are there right now. While Jobson’s vocals are a polarizing feature, [I have no problem as I see him as “part of the mix”] I can understand if others were put off by his glottal bellowing and martial chanting. As for his alleged pretensions, please, give me a lyricist who is not content to traffic in rock cliché! While coupled with music as straightforward and as eager-to-please as what Stuart Adamson provided, I fail to see how the end result could be considered in any way pretentious. I do believe that I am ready to hear the whole story and have added the 6xCD “The Virgin Years” Skids BSOG to my ever-lengthening want list. It was released last year at a price of just a few dollars more than what I paid for these two discs, so how can I say no? This entry was posted in Record Review, Scots Rock and tagged 1980, 2008, DLX RM, Richard Jobson, The Skids. Bookmark the permalink. “It dropped the listener right down into “An Incident In Algiers” midway; perhaps as a consequence of it being improvised. There may have been no beginning to it as such.” No, they made a mistake when transferring the orignal music from tape and cut out the first 20 seconds or so. It does have a beginning and it can be clearly heard on the original cassette and vinyl album issue. Obviously someone who knew the orignal songs did not Quality Control this! Duncan Watson – Welcome to the comments! This is fascinating to hear. Now I wonder what awaits me on the Virgin Years set? I do hope you have the Virgin Years set because it is a beauty. They have fixed the two glaring errors; the afore-mentioned missing start to “An Incident In Algiers”; and on the original mix CD of Days in Europa, rather than putting the original b-side single recording of “Out Of Town”, someone found the album version from The Absolute Game and put it on there instead. now, the glorious original recording is restored in its rightful place. There is one tiny typo I spotted. On the rear of the Days in Europa (remix) album, they have missed out the “Et” in ” Dulce Et Decorum Est (Pro Patria Mori)”. It is minor. Maybe it was missing from the rear of the original vinyl album sleeve – I do not know. This mistake does not detract from the very majestic box set. You can complement it by plugging the gaps of the few missing tracks by buying “The Singles Collection 1978-1981” and then your life is complete! Duncan Watson – Thanks for the data. I need to get this, but not before I pledge for the new Skids album on Pledge Music.